11 February 2018, Dubai UAE: Korean beauty leader Vitabrid C12, is proud to announce the launch of their Vitamin C driven skin and hair care products across the Middle East this week. Orders for the highly-anticipated product are now available exclusively on their website. Vitamin C has proven beneficial to the skin for brightening tone, boosting collagen levels, diminishing spots and producing an antioxidant effect. For hair, it can strengthen thinning and weakening strands, promote hair regrowth, prevent hair loss, and protect the scalp from UV exposure. Following its widespread success in Korea and Japan, being personally endorsed by celebrities and K-Pop Stars, the brand is continually making waves in the beauty world, most recently signing an exclusive distribution deal with Barney’s New York resulting from their successful North American launch. 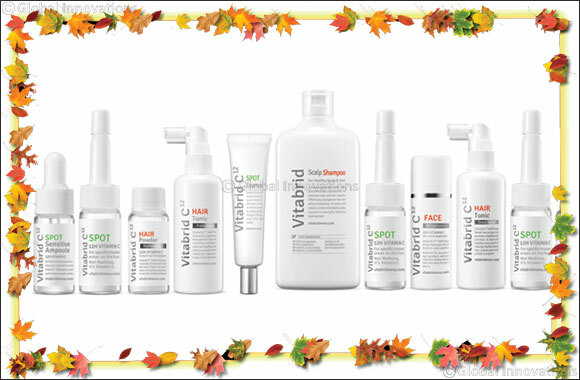 The Vitabrid C12 line is driven by Vitabrid CG, a Vitamin C complex (ascorbic acid, zinc oxide, glyceryl monostearate) that has never been used before in a beauty line. It relies on patented Layered Double Hydroxide (LDH) technology, billed as proprietary organic-inorganic hybrid technology that encapsulates active vitamin C between bio-friendly mineral layers such as stabilizing zinc, to deliver it continuously for over 12 hours. Vitabrid CG was developed at South Korea's prestigious Ewha Woman's University. The core technology was recognized as one of the most innovative technologies by MRS and C&EN. In addition to these accolades, the brand received the Trendsetter Award at Cosmoprof North America, an award given to companies with the potential to lead future trends. Monde Selection of Belgium, also known as the Nobel Prize in the field of cosmetics, chose Vitabrid SKIN and HAIR as the Grand Gold Award winners in 2016 and 2017. The brand was also recognized in ‘Nature’ Magazine as one of the most Innovative Technologies of 2017. Vitabrid C12 Face Powder is an advanced form of vitamin C that penetrates the skin and is time-released over a period of 12 hours which works to brighten the skin and combat dullness (providing 24-hour vitamin C delivery if used twice a day). This powder form Vitamin C cosmetic is mixed on the spot with any moisturizer, liquid skincare product or water to assure most effective use. Its highly potent Vitamin C complex helps brighten and minimize fine lines and wrinkles through collagen synthesis. Vitabrid C12 Scalp Shampoo and Hair Tonic Kit is used to combat hair loss and promote regrowth while reducing hair fall in men and women as it fully cleanses the hair, promoting scalp nutrition and moisture balance. Vitabrid C12’s SPOT Powder is a targeted formula that delivers active vitamin C to the skin over the course of 12 hours to effectively clear and repair the complexion. This powerful product provides excellent sebum control, offers antibacterial benefits, and decreases recovery time of the troubled area. Vitabrid C12's SPOT Acne Solution is a specially formulated ampoule designed to clear skin tone when used with the SPOT Powder, while Vitabrid C12’s SPOT Essence is a specially-formulated solution that controls oil while hydrating the skin for a clean, healthy-looking facial glow. “We are thrilled to bring Vitabrid C12 products to market in a region which we feel will truly benefit from the Korean beauty standard. Long hours at work, air pollution and frequent travel take a toll on the skin, especially for skin conscious consumers from the Middle East, but Vitabrid will combat these issues and work to effectively maintain skin health and glow,” said Beomwook Han, Vitabrid’s Senior Managing Director. Vitabrid C12 products are now available exclusively on their website for delivery to 14 countries. Free delivery is offered for each order within the UAE and will be delivered within three days of purchase.